When it comes to growing peanuts, we can all learn a little something from Virginia Blass! Virginia hails from the great state of South Carolina, and growing peanuts has been a way of life for a couple of generations. Peanuts are unique in how they grow and produce. The plants produce small, yellow blossoms that are self-fertilizing. Once the peanut plants bloom, small protrusions called pegs grow down from the plant. As they touch the soil below, they pegs grow into the soil. It is there where peanut pods begin to grow from the pegs under the earth. Although peanuts grow best in warmer climates, they can successfully be grown farther north as well. To grow in cooler areas, fast maturing varieties such as Champ Early can be tried. Unlike typical peanut varieties that can take 130 days to be ready for harvest, the fast maturing selections can be ready in 95 to 100 days. If you do live in a cooler climate and want to attempt growing peanuts, you can start transplants indoors to get a jump on the growing season. You can get 6 to 8 weeks of transplant growth in prior to setting outdoors, cutting the maturation time greatly. Start with a good quality potting soil, and plant seeds in a container at least 4 inches in depth. Plant the “seed” peanuts about 3/4″ deep in the potting soil. Water as needed, and then transplant when the threat of frost is past. 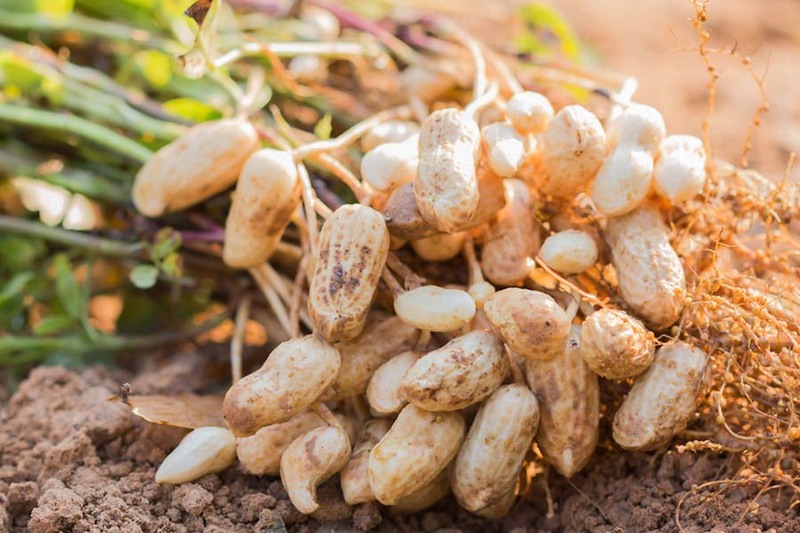 Seed Links : Traditional Variety : Jumbo Virginia Peanut Seed, Quick Maturing Variety : Champ Early Maturing Peanut Seed. With that said, let’s take a look at Virginia’s hints and tricks to growing peanuts traditionally in the warmer southern-state climates. More than anything else, peanuts need to be in the sun. We have always grown our peanuts in the backyard where there are no trees at all. Peanuts need warm soil and sun – so keep them out of any shady areas. Peanut transplants getting a head start indoors. We till up the ground in early spring and then plant 2″ deep in the soil about 6″ apart. When the plants begin to grow about 4 to 6″ high, we hill up soil around each side of the plants. This give plenty of soil for the pegs to get into the soil. It also makes it easy for the peanut pods to form. As soon as our plants start to die back, we harvest. For us here in South Carolina, that is usually the first part of September. We pull up the entire plant and hang in the barn to dry. A couple of weeks usually does the trick. We boil our peanuts for about 3 hours in a big kettle of water, using a cup of salt to about 5 gallons of water. They are simply the best tasting peanut you could ever ask for! Thanks Virginia for the tips! Do you have a garden tip you would like to share? Or perhaps a few photos and a short story about your own garden? Email us today at info@thisismygarden.com and share it with our TIMG community. You can also use the “Feature My Garden Tip” button at the top of the website to submit your entry. This article may contain affiliate links. March 20, 2019 TIMG Comments Off on Dividing Ornamental Grasses – How To Create New Plants For Free! September 1, 2018 TIMG Comments Off on How To Make Homemade Hot Pepper Flakes From Fresh Peppers!